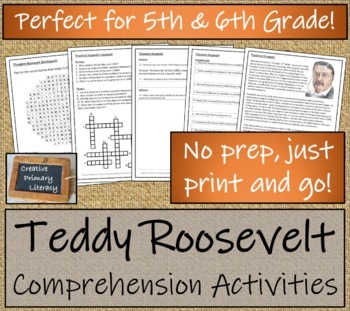 Informational text activity with comprehension and grammar questions about Influential US President Theodore Roosevelt. 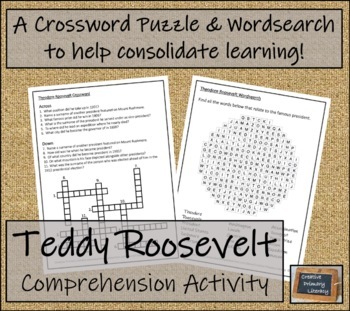 This activity is part of the Influential US Presidents - 5th & 6th Grade Close Reading Activity Book- four activities for just $3.00. Activities look into the lives of George Washington, Thomas Jefferson, Abraham Lincoln and Theodore Roosevelt. 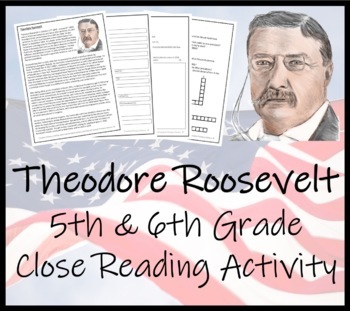 The resource is a close reading activity about the life of Theodore Roosevelt - the text looks at facts about his life, and concludes with comprehension and grammar questions. 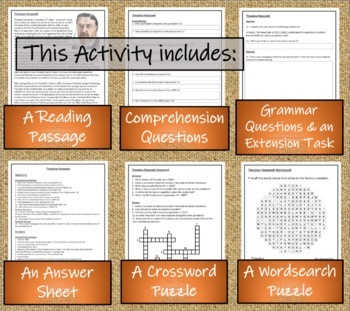 It also contains an extension activity for fast-finishing students. It is aimed at students between the ages of 9-12. It is ideal for a homework activity, a reading group activity, guided reading, exam/test preparation etc. The activity requires NO PREP; it has a body of text that students need to read through thoroughly; then they can use the text to find the comprehension and grammar answers. All texts then have an extension activity for those fast finishers. If you would like an example of the type of activity this is please look at my example Macbeth Activity 5th & 6th Grade Close Reading Activity. Also, if you liked the activity why not look at one of our other Reading Comprehension Activity Books. Our World War II Collection - 5th & 6th Grade Close Reading Activity Book is 10 activities timelining the war for just $4.50. And, our Non-Fiction Collection - 5th & 6th Grade Close Reading Book contains ten activities, al for just $4.50. We also specialise in play scripts, we have a William Shakespeare collection with Richard III, Macbeth and Hamlet. And we have a good selection of Christmas play scripts including Elf, The Santa Clause and A Christmas Carol.